The consent issue has several forms; among these: the consent of the hosts and of the parties to a conflict; of the people living in the conflict area; that of the troop contributors to a peace force; and the consent of the major powers, especially the permanent members of the Security Council of the UN (the P5). The first two are often the most critical: we might refer to them as the consent of the parties and the people. We certainly cannot ignore the importance of the consent of the troop contributors – without them we have no force, or of the Security Council – without them we have no mandate. Nevertheless, I will generally focus on the issues of local consent: in which I include the host government, the sub-state parties, and the people. These, which I by no means take to be the same thing or even in some cases very much alike, are nevertheless in my view collectively the true conditio sine qua non of a successful intervention. There has since late in the last century been a growing tendency to contemplate and to mandate peace operations founded under Chapter VII of the Charter, which is implicitly non-consensual in its tone and presumably, in its intent. It might seem that peace operations are indeed beyond the age of consent. That is in principle; however in practice peace operations have continued to be very conservatively structured and even more cautiously executed, and missions have continued to negotiate the terms and the extent of operations specifically intended to enforce peace. This is no less true of the current vogue for the Responsibility to Protect (R2P), than it was of the rash of “enforcement operations” of the 1990s. 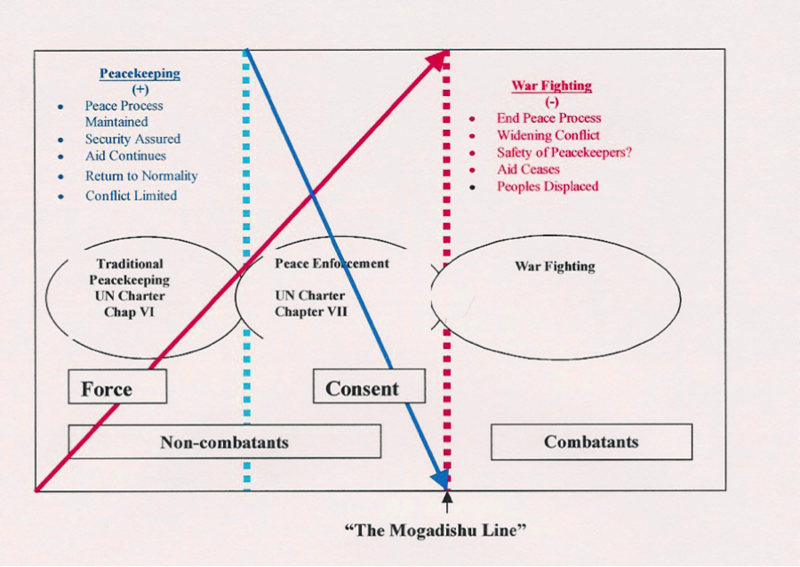 To see why this has been, and largely remains, the case, I want to review the origins of the issue of consent in peace operations, and see what that has subsequently come to mean. To do this, we will review the first modern peacekeeping mission, the United Nations Emergency Force, as it formed up in the autumn of 1956, where the issue first arose and was to be of fundamental importance. We will then fast-forward to Eastern Slavonia almost 40 years later, and we will visit there the birth-place of the practice – and only later the concept – of “induced consent.” (Alex Morrisson, the founder and President of the Pearson Peacekeeping Centre in Nova Scotia, once said, while a student at the Canadian Army Staff College, “It certainly seems to work in practice, but how will it stand up in theory?) It is a large part of the story of peacekeeping that practice often and necessarily precedes theory. Finally, having established where we really are, we will peek briefly through that R2P looking glass to see where we might be going with 21st Century peace operations. As written, that “policy” largely describes non-consensual military intervention to “protect”, but its authors have been back-pedalling on that almost since before their ink was dry – and no wonder. We know what they said, but it seems that may not have been what they meant, and we need to look critically at this “new norm.” We can only hope this will allow us at least a glimpse of what John le Carre has called “the recent future”. Sometimes, to get ahead, we need to go back. In preparing this posting, I need to thank Russia, China and Syria, who in fanning the flames of tragedy have provided me with further insight into the importance of consent at multiple levels. And that is what I want to share with you in this posting. I will be referring rather frequently to two very important chapters of the Charter of the United Nations: Chapters VI and VII. 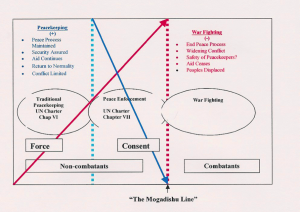 Chapter VI refers to the “pacific settlement of disputes”, and is the basis for “conventional” peacekeeping, a term which in fact is found nowhere in that Charter. As we shall see, it has been traditionally inferred that such measures as described therein would only occur with the full consent of the parties. Chapter VII of the Charter is often referred to as the “enforcement” chapter, and it describes more forceful measures, including military force, to restore and maintain peace. This was used only twice in the first nearly half-century of the UN: in Korea in 1950, and in the Congo in 1962. It was not used again until the First Gulf War and the weapons embargo of Yugoslavia in1991. However, it was used 11 times in 1993-94 in respect of BiH alone. It is clear from that record only that almost no one had any idea what the difference was, nor what it might mean to those charged with executing a Chapter VII mission. The circumstances surrounding the launch of the first modern peacekeeping mission, the United Nations Emergency Force, in 1956, illustrate several facets of the consent issue, many of them surprising at the time, and some still today not fully appreciated. The developments in the Middle East, especially with respect to the closing of the Suez Canal by Egypt, the Franco-British military response and the resulting disarray in the international community, are well documented and need not be re-told here. For our purposes, we can begin on October 30, 1956, with the veto in the Security Council, by France and Britain, of a U.S.–sponsored resolution calling upon Israel to withdraw from territories she had occupied in the wake of the Anglo-French invasion. A Soviet amendment designed to dilute the force of the original resolution was also vetoed. The next day, the Yugoslav representative offered a resolution under the “Uniting for Peace Resolution” (also referred to as “The Acheson Plan”) to move the issue to an Emergency Special Session of the General Assembly – as this was a procedural matter, it was not subject to veto. The referral was passed over the objections of France and Britain, and the Special Session convened on November 1. 0300 hrs, Sunday, 4 Nov – The USSR vetoed a US-proposed Sec Co resolution calling for a Soviet withdrawal from Hungary. The Sec Co and the GA met 15 times from 28 Oct-5 Nov: 9 times on Suez; 5 times on Hungary. The only Sec Co resolution passed was a procedural issue, whereby the Middle East situation was referred to the GA, and which did result in the formation of the first armed peacekeeping force: the United Nations Emergency Force. There were four vetoes in the Sec Co in that less than two weeks. … which then essentially closed down – for the next 45 years. This was, in effect, a regional enforcement action without Security Council authorisation; Chap VIII provides that : “ … no enforcement action shall be taken by regional arrangements or by regional agencies without the authorisation of the Security Council” (Article 53.1) , and is thus, despite the Soviet pretence of Hungarian “consent”, quite similar to the NATO action in Yugoslavia in 1999. The subsidiary issue which might be raised today would concern the legitimacy of the Hungarian government of that day, and thus of the validity of their “consent” to the Soviet action. The Secretary-General had been quietly preparing an observer mission to Hungary, to which the U.S.S.R. had strenuously objected as a violation of sovereignty (whose they did not specify, and they had at any rate the “consent” of Hungary for their intervention). Quite naturally, they perceived the proposed intervention in the Middle East as a highly dangerous precedent that, if they could not prevent, they might effectively derail. Thus on 5 November, in an apparent (but transparent) move to strengthen the action in the Middle East, The Soviet Union proposed that the action should be an enforcement mission under Article 42 of the Charter. As this had only been done once before in the history of the U.N. (establishing the U.N. Command in Korea in 1951), it was highly unlikely in this context that the member states would authorize such a mission (there was indeed to be only one other – in the Congo – in the next 35 years). Clearly, the Soviet proposal was not intended to strengthen the prospects for peace, but was based on a canny appreciation of the then-limits on, and the critical importance of, consent. Note that the use of the term “enforcement” was seen as a show stopper. But, as the Force was finally deploying, there came one more twist on the consent issue. Canada had agreed to provide an infantry battalion, and the battalion was duly moved from its barracks in British Columbia by rail, 4,400 miles to Halifax, where it was to take ship to the Middle East. On the eve of their sailing, however, Nasser learned from a press release of the name of the regiment from which this battalion was drawn: they were “The Queen’s Own Rifles of Canada.” Nasser was not having anything of the Queen’s on his territory, and the battalion returned, sadly disappointed, to their barracks. I frankly fail to see how, as constructed, the UN force could be instrumental in forcing on Egypt a solution of the Canal question other than one freely negotiated. Several years later, in 1964, Archbishop Makarios’ objection to black troops for UNFICYP was, very quietly, allowed to stand. Makarios, who might have had much in common with Nasser, did not object to a Canadian battalion from the “Royal Vingt-dousieme Regiment du Canada,” who were closely followed by those same Queen’s Own Rifles of Canada, to whose inclusion in UNEF Nasser had objected. Much later, in his report to the General Assembly on 24 January 1957, Hammarskjold observed that “The use of a military force by the UN other than under Chapter VII, the enforcement chapter of the Charter, required the consent of the states on whose territory the force was to operate …”. Ironically that first peacekeeping operation was to founder on the withdrawal of consent by the Egyptian Government in 1967, a strategic blunder by Nasser which led to the (for him) disastrous Six-Day War. The deposed Premier of Hungary, Imre Nagy, was executed in June 1958. The enforcement provisions of the Charter were tacitly abandoned. He was almost right: there were only two Chap VII operations in the Cold War period: Korea and the Congo. There were no others for almost 30 years, until the Gulf War and the arms embargo of the former Yugoslavia in 1991 (which were both Chapter VII Resolutions), but there were 11 such resolutions by the Sec Co in 1993-4 in respect of Bosnia Herzegovina alone. Were Lehmann writing today, she would surely include a fifth form of consent – that of the motely crew of sub-state and non-state actors: the “militias” in the former Yugoslavia; the “technicals” in Somalia; the “attaches” in Haiti; or the mercenaries, as in the Congo in the 60’s, and (reputedly) in Iraq and in Afghanistan today. These are commonly interposed between a weak government and a divided and ill-informed people, often invalidating any consent gained of either government or people and also often opposed to and intending to spoil any peace process. And even these five may and often do have some further permutations, including off-shore sponsors such as customers for blood diamonds or oil, and/or the purveyors of weapons. These may be party to no negotiations, and nearly immune to external pressures. Their apparent acquiescence to an operation is, to say the least, usually not very reliable. Incidentally, in the period 1946-1990, there were 186 Sec Co vetoes (118 of these were by the USSR); from 1990-96 there were only 7. There was thus some good reason in the immediate aftermath of the Cold War to believe that at least Sec Co consent would be less of a restriction than heretofore, but of course that has not been the case: China has repeatedly threatened to block tougher UN action in the cases of Sudan and Zimbabwe, and Russia and China have recently vetoed a UN Sec Co Resolution (UNSCR) in respect of Syria. Sudan further said increases to the AU force must “of course be done in consultation with the government of national unity.” Sudan would in this case “allow” the EU to provide logistical support. Sudan initially rejected the expansion of the UN mission to Darfur. On 22 October 2006, the Special Representative of the Secretary General (SRSG) was declared persona non grata, ostensibly because he had reported on continuing violations of the Darfur Peace Agreement, then only 10 days old. He had reported that the Government of Sudan was still seeking a military solution in Darfur, and was continuing to commit gross violations of the Peace Agreement. They were mobilizing additional forces, especially in the south, and were maintaining offensive air operations. The AU force was bombed by the Sudanese air force. On 4 Aug 2011 Sudanese authorities threatened to shoot down a helicopter which had been called to evacuate Ethiopian Blue Helmets, eleven of whom had been been wounded in a mine incident. While the UN attempted to negotiate clearance for the flight, four of the soldiers died. The International Commission on Intervention and State Sovereignty (ICISS) released its report in December 2000. Now generally referred to as The Responsibility to Protect (R2P), the document ostensibly became U.N. policy when it was embraced by the Report of the Panel on United Nations Peace Operations, and by nearly all member states of the U.N., in September 2005. That “policy” as it was written is largely based on military action in accordance with Article 42 of the Charter. However, it is today very clear that the Security Council will seldom authorize a forced intervention in a member state – the issues of consent of the “hosts” and respect for their “domestic jurisdiction” are as strong as ever. As I have described, the issue of consent as a factor in launching and maintaining an intervention arose with the first peacekeeping operation, the United Nations Emergency Force. This Force encountered for the first time the several aspects of the consent issue (then principally concerned with the consent of the “hosts”); the quick-fix solutions to the problems raised by this became, almost inadvertently, doctrine. The jumble of ad hoc doctrines which thus arose contributed much to failures to prevent and to protect in Rwanda in 1994 (where the consent of the troop contributors – in actual fact, the absence thereof – was an important factor). These failures are being repeated today in Darfur and in Zimbabwe and for essentially the same reasons, the central one being the traditional concern for host consent to the intervention. However, in the latter two, in addition to all the other problems, there has been added the issue of Security Council consent, as China has continually threatened to use her veto in matters affecting her clients, which include Rwanda, Sudan and Zimbabwe. Nevertheless, the promulgation of the doctrine of a responsibility to protect seems to portend a significant shift in the perception of the role of sovereignty, explicitly describing the responsibility of the international community to judge if, and to act when, sovereignty should on humanitarian grounds be set aside. Nevertheless, there has as yet been no operational manifestation of a paradigm shift in this regard, and no effective intervention has yet been mounted in, for example, Zimbabwe. The Sudanese government has been left to dispute, to block, to refuse to consent to, any useful interventions, and has continually meddled in force structure and methods of operation, including restrictions on or denial of freedom of movement. Common to most failures to protect and to prevent are dispute of the evidential facts by the “hosts,” who are in clear point of fact the perpetrators of crimes against their own people . Also common to both Sudan and Zimbabwe has been the culpability of neighbours and patrons, as seen by their inability or their unwillingness to restrain those governments. And in common with both emergencies, only the pressure of international public opinion on patrons and neighbours has any hope of creating the climate necessary to a truly effective intervention, in these cases principally China and South Africa: China supports, and South Africa has shielded from criticism, inter alia, Zimbabwe and Sudan. Each individual State has the responsibility to protect its populations from genocide, war crimes, ethnic cleansing and crimes against humanity. This responsibility entails the prevention of such crimes, including their incitement, through appropriate and necessary means. We accept that responsibility and will act in accordance with it. The international community should, as appropriate, encourage and help States to exercise this responsibility and support the United Nations in establishing an early warning capability. Uniformity of action: Rwanda 1994, Sudan 2005/06, might have been might-have-beens, but Tiannamen Square 1989? Unrealistic expectations of external intervention are raised, as in Hungary 1956 and Czechoslovakia 1968. Perpetrators of violations use international and regionaI organizations, and other outsiders and neighbours as a sort of diplomatic sanctuary : Rwanda sat on the Sec Co in 94 and voted against an arms embargo on Rwanda; the African Union has steadfastly refused to criticize Robert Mugabe, who is also supported diplomatically, financially and with military hardware by China; Sudan is active on its own behalf at the UN GA today; Russia and China provide Syria with a shield in the Sec Co.
I’m regularly asked questions along these lines: If Darfur is so awful, then shouldn’t we just go in with guns blazing and rescue the people? And of course, then what? Given an enforcement mandate, and appropriate rules of engagement – and all of the above were thought to have been in place then – what would you do for those injured peacekeepers , four of whom died while you were attempting to negotiate their evacuation? Much of the literature on peacekeeping treats the consent of the parties as if it were an independent variable. It is not, for the simple reason that the decision of the parties to grant consent is never taken in a vacuum. It is, rather, a function of the alternatives. If consent carries with it certain rewards, and the failure to grant consent carries with it certain costs, this obviously affects the decision as to whether or not consent will be granted. The purpose of coercive inducement is “to intimidate recalcitrants into cooperating”. Operations of this nature will “take into account that hostile consent was granted only in the face of intimidating force, and that a credible force is required if consent is to be maintained”’. Despite this, the peace force will assume that much of the host population has freely consented to and supports the operation, thus the aim of an inducement operation is to build, not to destroy”, controlling with the necessary force the extremists who oppose reconciliation and would continue violent conflict for their own ends. Bluffing is dangerous and must be avoided. There are, however, limits on the use of coercive consent: “the intimidation factor will erode over time”’, its usefulness may be constrained by weakness in the consent of the sponsors (see Lehmann, above) and, most importantly, coercion cannot resolve conflicts. ‘We told them it would be a good idea to leave, then we showed them what a good idea it would be to leave, and then they left’. No wonder it’s often called “Carrot and Stick”. The UN had arrived in Bosnia prepared for a role of traditional peacekeeping in accordance with Chapter VI of the UN Charter, but it was actually required to operate in the more demanding Chapter VII role. Under Chapter VI, the combatants agree to end their conflict and invite the UN to become a mediator to help negotiate and implement the elements of a peace deal. Under Chapter VII, however, it is likely that there will be no prior agreement to end the war and the mission of the UN will be to deliver humanitarian aid and to help create the conditions in which the conflict can be brought to an end. If there is little consent for the presence of the peacekeepers, as in Bosnia, a great deal of enforcement may be necessary. Note that an early expectation of absence of consent will usually imply an expectation of greater, and earlier, use of force. Thus I have superimposed a blue line, for consent, and a red line, for use of force. They are roughly in inverse relation to each other: as consent deteriorates, force may increase, and vice versa. The force structure ought to be driven by a realistic appreciation of where we are on the red line, and not by over-optimisitic views of where we are on the blue line. Those eleven Chapter VII UNSCRs over UN operations in Bosnia Hercegovina? They did not result in one single reinforcement for UNPROFOR – the Security Council was bluffing, and neither the peacekeepers nor their protagonists took them seriously for one minute. … a condition where liberal and illiberal norms, institutions and actors coexist, interact and even clash. To whomever I have mentioned this concept, the question is immediately posed: “How is this different from saying that the ends justify the means?” It might be called the Guantanamo Principle of Situational Ethics. However it may well be, and come to think of it often is, that illiberal means must at least temporarily be harnessed to liberal goals – this is hybridity, and it is in fact a common condition of peace operations, just as it is of law enforcement, a central point on which Peacehawks has been founded. Perhaps that essential question needs to be rephrased, even reversed as, perhaps: “Do the means suit the ends?” Another part of the answer to that first question is that the quality of the means will be an essential concern of governance, whatever form and whether indigenous, external or, as is often the case, a blending of external and indigenous functions. The notion of hybridity in peace operations can be expanded to embrace the consent issue as well, as the players: international, regional and local; governmental and non-governmental; military and civilian – may grant, withhold, reinterpret or withdraw, consent to an operation without warning or explanation, not even to each other. The peace mission must be prepared to manage these contradictions creatively and patiently, and may well have to use some force to do this. We admit we need to think more about this term and the issues it raises, and we will share that thinking with you in a later posting for Peacehawks. We are not past the age of consent in peace operations, and we never will be. This will continue to be the conditio sine qua non for the success of an operation, but it may not be quite so absolute a requirement for launching an operation. In case of less (or less anticipated) consent, the creation and maintenance of consent will be a major aim of the operation. Remember that this is a multi-layered thing: international, troop contributors, host government, parties to the conflict and host people. This will of course be a major function of the public information campaign which supports an operation. And doesn’t this all sound all too familiar? On 13 Feb this year the UN High Commissioner for Human Rights, Ms. Navi Pillay, addressed a special session of the GA, castigating Syria for “intensifying their deadly repression” of their own people: the special session was held over the objections of Syria. President Bashar al-Assad has called all attempts at intervention “an unacceptable interference in Syria’s sovereignty”. Russia opposes any peace force in Syria as it would “be meaningless without a cease-fire.” In other words, without a peace to be kept, which implies a consensual intervention, to which there is little sign that the present Syrian government would ever CONSENT. The current observer mission is essentially toothless – and we’ve certainly seen enough of that sort of “peacekeeping”. Is there a way forward here? However an intervention may eventually be mandated, our prevention and protection toolboxes must have in them the means to create consent to whatever is needed for the prevention of crimes against the people and, where prevention fails, to effect the protection of the people, “using all necessary means.” That will be difficult where the greatest threat to the people comes from their own government, but it is precisely where the “hosts” are the perpetrators of crimes against their own peoples that the international and regional communities must act. It’s all there, in the Charter, just where it’s been for the last 67 years. What over a half-century of peacekeeping operations has made abundantly clear is that the major actors, from the Security Council to the people, must want peace, they must be prepared to take risks to get it and they must accept compromises to keep it. We also ought by now to have learned that those who equate peace with victory will, to paraphrase Churchill, certainly have neither. Those who would help to manage and eventually to resolve conflict must do all in their power to create the essential climate of consent, and it is now urgent and imperative that they find the tools to do so. A comprehensive review of these events is given by Sir Brian Urquhart in Hammarskjold, Harper Colophon 1972, pp 132-231. Article 18.2 of the Charter of the United Nations specifies that “Decisions of the General Assembly on important questions shall be made by a two-thirds majority of the members present and voting. (Italics added). Thus, given a quorum, absences and abstentions would have no effect. See Basic Facts About the United Nations, United Nations, New York, 1998, page 7. Lehmann, Ingrid A., Peacekeeping and Public Information: Caught in the Crossfire, Frank Cass, 1999. Arbuckle, James V., Military Forces in 21st Century Peace Operations: No Job for a Soldier?, Routledge (Taylor and Frances Group), 2006, page 107.